Google released a new Google Labs experiment related to image search: Google Image Swirl. The service "organizes image search results based on their visual and semantic similarities and presents them in an intuitive exploratory interface." 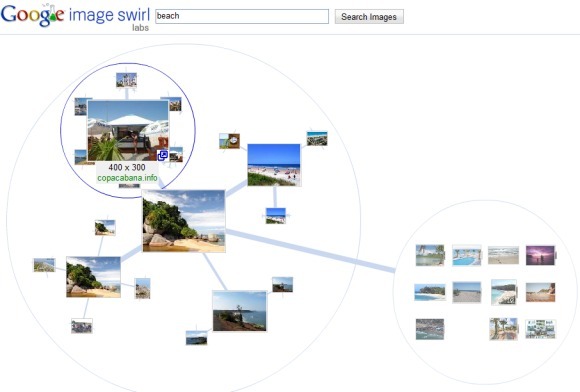 Google Image Swirl clusters the top image search results for more than 200,000 queries and it lets you explore the clusters and the relation between images. "Once you find the group of images you're interested in, you can click on the thumbnail and a cluster of images will "swirl" into view. You can then further explore additional sub-groups within any cluster. Image Swirl expands on technologies developed for Similar Images and Picasa Face Recognition to discern how images should be grouped together and build hierarchies out of these groups. Each thumbnail on the initial results page represents an algorithmically-determined representative group of images with similar appearance and meaning. These aren't just the most relevant images — they are the most relevant groups of images," explains Google. Try queries like: jaguar, flowers, van Gogh and keep in mind that this is an early demo, so not all the queries will return results. Google has two other visualization tools: "wonder wheel" for exploring related searches and YouTube Warp, an interactive way to visualize related YouTube videos. It would be cool if they incorporate a size option and pretty much all the other stuff that regular image search has already. That's really amazing... this technology will help the regular G visitors to gain somewhat again more than the traditional one. Again, the image search will become more simpler than previous. At the moment it looks like just a flashy (but very cool) interface. When I used it yesterday the "groups" of Eiffel Tower photos seemed incoherent - there was no one clear theme or visual element that clearly differentiated one group from another. That's not to say it won't improve over time though - Google will no doubt refine its algorithms between now and the end product (it is in Labs, after all). Its really amazing technique . We can easily found the image we want . It would be nice if they could display the relationship between the pics. That would be more helpful in the search, I think. This will be a great tool for blogger looking for that "just right" image. cool..but is it really useful? Wow, talk about innovation, I always wondered if google images could be improved. The others can't even hope to imitate. Oh, and I also had fun searching. Now, google needs to spend a little more time building the database to keep up with all the images on the web. That was great to know about it. As we get search options in websearch , that should be introduced. this is awesome! probably my favorite thing to come out of google since gmail. Don't be evil, ok? When you take down a service, which official Google pages are still linking to, then either explain why, or provide a redirect, or at least a 404 page.